This post is a paid partnership with BC Tree Fruits. As always, all opinions are my own. Thank you for supporting my blog & helping me work with organizations I love. 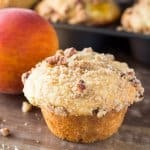 These peach bars combine the 2 best peach recipes around – peach pie & peach crumble into one delicious, easy peasy, peach recipe. The key to any recipe with fresh fruit is starting with the best produce around. You want peaches that are sweet, soft, aromatic, & extra juicy. The kind that you need to eat over the sink because there’s so much juice running down your elbows. And that’s exactly why I always opt for BC Tree Fruits peaches. They’re grown in the Okanagan Valley in British Columbia, and in season from late July til the first week in September. 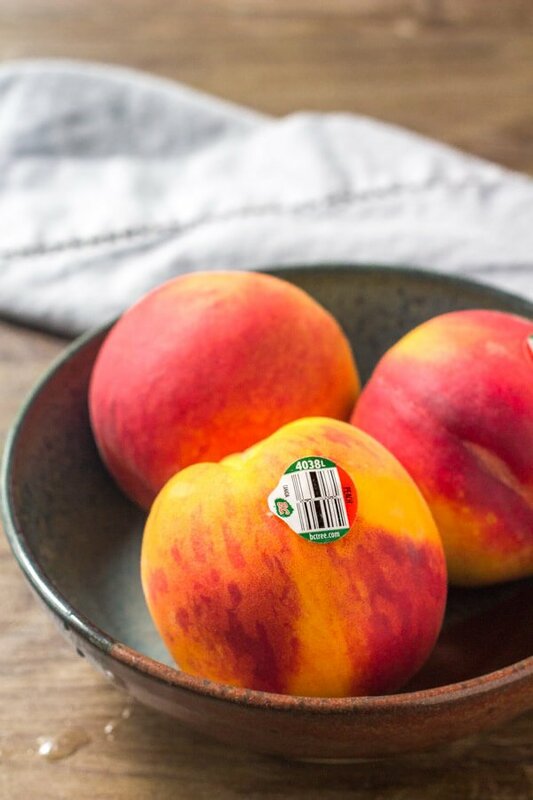 So when you’re grocery shopping, look for the BC Tree Fruits sticker so you know your peaches are premium quality. These peach pie bars are so easy to make and such a perfect way to enjoy fresh peaches. The bars have 3 delicious layers – but the sweet, fragrant BC peaches are the star of the show. The base is an easy shortbread recipe made from flour, powdered sugar, a little salt & melted butter. It gets pressed into the bottom of the pan and baked for about 15 minutes before the other layers go on top. The middle layer is our juicy peaches. It’s basically a peach pie filling made with fresh BC peaches, cornstarch, sugar & a little lemon juice. Then last but not least – the oatmeal crumble goes on top. It’s a crunchy oatmeal streusel with just a hint of cinnamon. Then the whole thing gets baked in the oven, and once they’re cooled it’s time to serve. 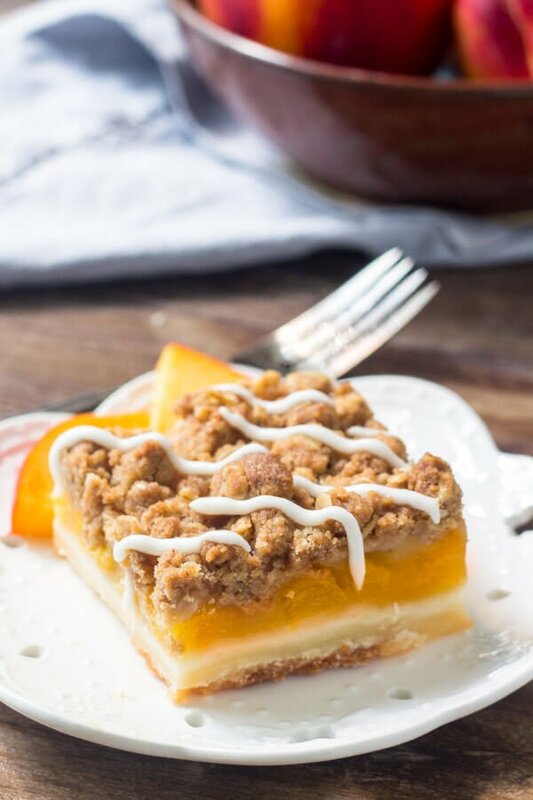 These peach pie crumble bars are delicious with a drizzle of sweet vanilla glaze or a scoop of ice cream. I also like them cold straight from the fridge. They’re buttery, full of texture, and most importantly – filled with the juiciest Okanagan grown peaches. 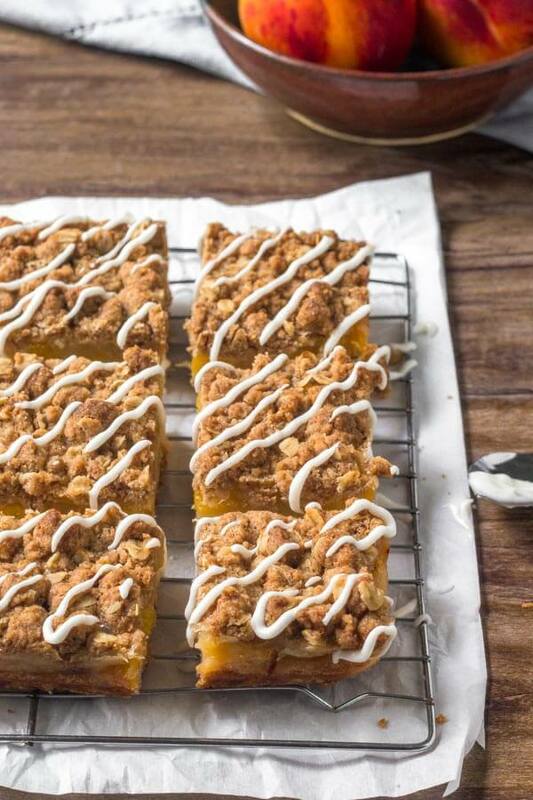 So head to the grocery store, look for the BC Tree Fruits sticker for the most delicious peaches around, then enjoy these peach pie crumble bars. 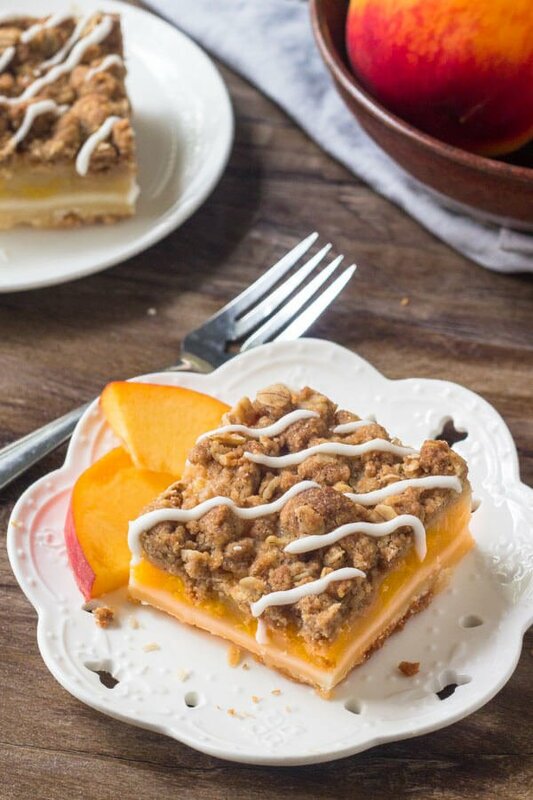 These Peach Pie Crumble Bars combine the 2 best peach recipes around - peach pie & peach crumble. They start with a buttery shortbread base. Then they have a layer of juicy peaches followed by crunchy oatmeal crumble. Preheat the oven to 350F degrees. Line an 8x8 inch pan with parchment paper, leaving an overhang around the edges. Make the Shortbread Base. In a medium bowl whisk together the flour, powdered sugar & salt. Stir in the melted butter. Press the mixture into the bottom of the pan and bake for 15 minutes. As the base is baking, make the peach layer. Toss the chopped peaches with the sugar, lemon juice & cornstarch until the peaches & evenly coated. Make the Crumble Topping. In a medium bowl stir together the flour, oats, brown sugar. Then stir in the melted butter - it should resemble wet sand. Spread the peach mixture on top of the baked shortbread base. Then crumble the oatmeal crumble topping in your palms, and sprinkle over top of the peach layer. Bake in the preheated oven at 350F for 35-45 minutes, or until the top looks golden brown. In a small bowl whisk together the powdered sugar, vanilla extract & cream until smooth. Add in a little more cream or powdered sugar as needed. Drizzle the glaze over top of the bars. Added some BC plums- just great! This may be a silly question, but do you need to peel the peaches before chopping them? If so, do you have any easy tricks? I peel them. For a really easy way to peel them, I place the peaches in a pot of boiling water for about 1-2 minutes then scoop them out and place them in a bowl of ice water for a minute or 2. After that the skin easily slides off. This looks amazing! Would this work with all purpose gluten free flour? Thanks so much Gina!! I’m always a little unsure with gluten free flour since different brands behave differently. But this recipe isn’t overly picky, and if you’ve used it with other recipes before I’d say go for it! I hope you love the bars. These look incredible. Peaches from the Okanagan are some of the best I’ve tasted. 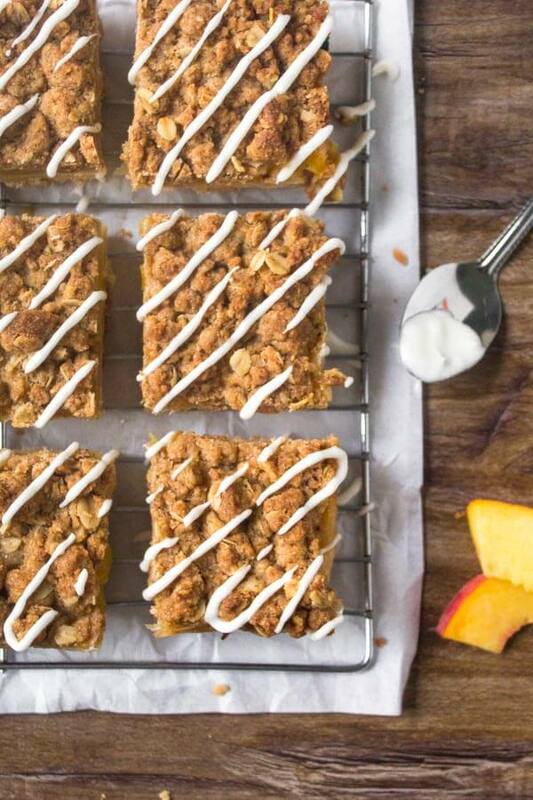 I would love to make a gluten free version of these peach pie crumble bars-they look absolutely scrumptious! Anything with crumble topping gets my vote!! Could you use peach pie filling? I haven’t tried, so I can’t be sure of the results. My concern would be that the pie filling would make the crust and crumble too doughy since it has a lot more liquid than sliced peaches. If you wanted to save time, you could use canned peaches – just be sure to drain them very well first and blot them with paper towel to remove the excess juice.